See the famous Bridge of Krk from a vantage point, once very famous, but now abandoned Gulf Voz. It is 67 meters high and 1,430 meters long. What’s that? The answer to this question you will find in the title. 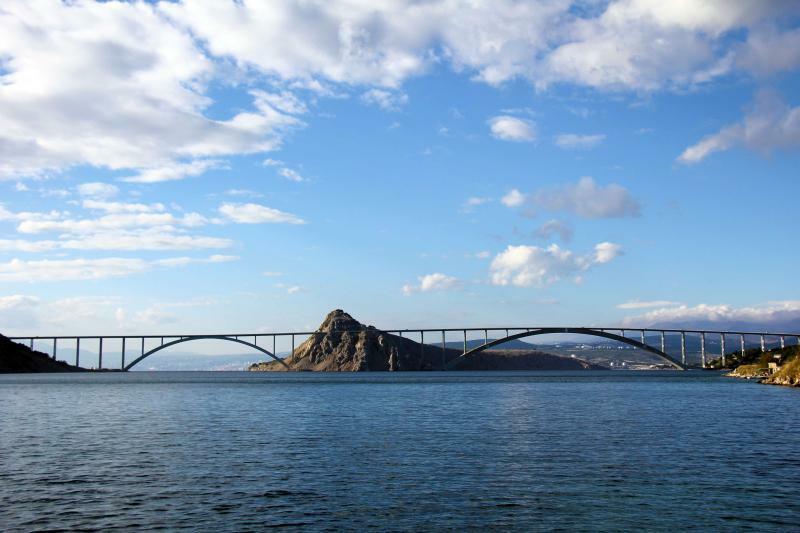 But still, this magnificent, two-lane road bridge that connects the island of Krk to the coast at Kraljevica, was opened on 19 July 1980. The bridge was designed by Elijah Stojadinović. They have started build it in 1976 under the patronage of the President of the Socialist Federal Republic of Yugoslavia, Josip Broz Tito. For this reason, earlier this bridge, which called the bridge of Tito. The bridge became world famous because of its concrete arch, which extends to the island named Sveti Marko, during the construction that was of the longest concrete arch in the world. It was 390 meters long and it was as much as 85 meters longer than the longest bridge in Sydney. They say that each year, about a million and a half vehicles are crossing this bridge . The area where the bridge was built, is on the north side exposed to a very strong wind, which causes the bridge to close sometimes. The closure of the bridge can be seen from the traffic light, that is, in the case of strong winds turned red. 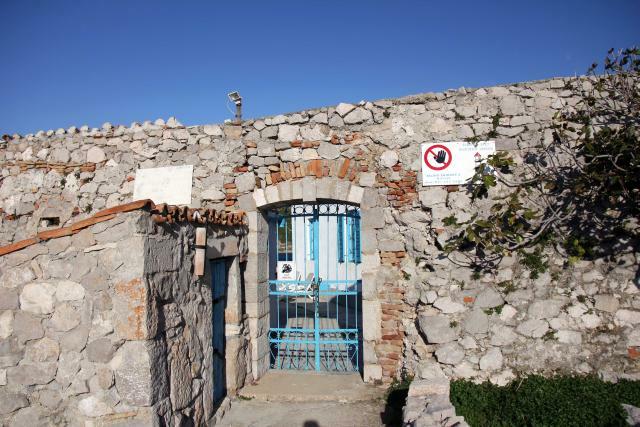 Sveti Marko is the northernmost island in the Gulf of Rijeka. Due to its important geographical position, transportation between the mainland and the Krk, the island has been known since ancient times, under the name Almis, which means the fetus. In the Middle Ages, it was called Omiš. Today it is best known for the fact that past his southern slope, leads Krk Bridge. Sveti Marko is triangular in shape, steep reef island rises from the northwest to the southeast, where over the bridge, the highest peak of the island is named “Glava” which has 104 meters. On the northern tip of Brodac there is a lighthouse, in the western Strait towards Omišalj is located the islet Selehovac. Eastern and south-west coast are steep and inaccessible, northwestern coast is somewhat easier to access. The upper ridge of the island is mostly naked and rocky with sparse grass and shrubs. The island is now largely uninhabited, except watchtowers along the bridge and occasional visit of fishermen and tourists. There is also a hypothesis that already in Roman times, here was a wooden bridge, but this idea had broke, as at that time there were a record of a strong wind, which would wind through the area 220 km / h. If we are realists than we find out that it is impossible for bridge wooden structure, to survive the force of such wind speed. The first real idea of ​​the bridge construction had occured in 1918, by entrepreneurs from Rijeka, who wanted to expand their business, move to the island of Krk and build a port in Malinska. Because of bad economic situation this project did not happen. Before the construction of the bridge, the island was linked to the mainland by ferries on the short line Črišnjeva – Voz. Voz was the bay where many people loved to swim. A great pleasure was also to sail in the bay by boat. When the ferry came into the bay or departed from, it created big waves which were very entertaining for the swimmers. Before the construction of the bridge Voz had been very important center, because it was the area, which was located closest to the mainland. Today, the Bay Voz is known primarily for being the nearest viewing point of Krk Bridge. If you want to enjoy a good view towards Krk Bridge the best and nearest place is Bay Voz. To get there you should follow the main road and then turn toward the airport Rijeka, and before that, on a small roundabout keep left and turn towards the Voz. Drive along the asphalt road that leads to the end of the bay, where you can park your car. In the bay you can see some of the stranded ships, abandoned restaurant and two old half-sunken ferry, which reminds us of the time, when this place was full of life. Today in the Gulf, you can see a few swimmers, but the place is never too crowded. Above the bay winds shorter route, along which you can see a lot of pleasant views on the Krk Bridge. Today in the Gulf of Peškara on the other side of the bay Voz, is a place of industrial activity, which caused that a very significant part of this magnificent wall collapsed or we can say got used almost to the sea level. When you rise above this wall, you can go forward on the path from where you can see the whole view of the bay. The more away you go from the smell off tar and gasoline, soon you see our old soney Krk, where the sun and the wind almost never rest. Because of this not too friendly landscape, I was surprised to see the sheep out there; who were struggling with only a few bunches of greenery. The road ends at the lighthouse, where you can also choose to swim. Water in this area is colder than the rest of the island. There is also a strong current, which takes care for a relatively clean sea. When we walked through the entire area, I got this feeling, like that in this part of the island the time stopped. Formerly known bays full of life had today remain only in the memories in the abandoned area. It think that we should re-invest some energy in this part of the island and revive it, which would difficult at all, since Voz bay with its magnificent and unique view has a great potential.